Whether you’re ready for an upgrade, shopping for a new vacation home, or hitting the road for the first time, there’s an RV for you. 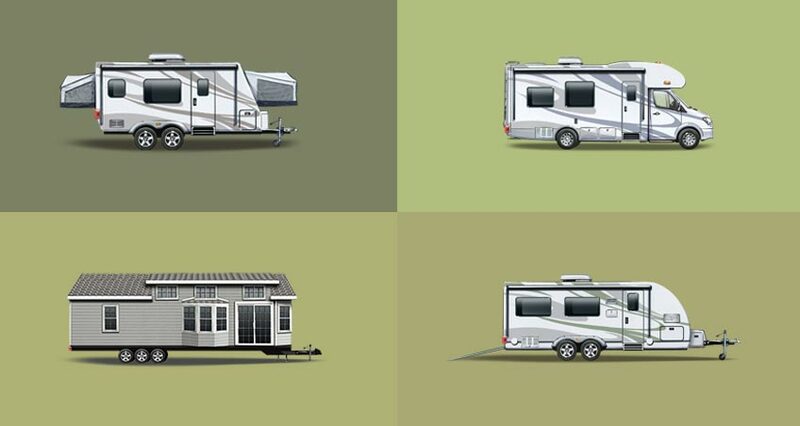 Options are as varied as your lifestyle, so it begs the question: ‘What type of RVer are you?’ Let’s find out. For you, the journey ‘ not the destination ‘ is the most important part of any vacation and your trips include plenty of moving around. With the flexibility of a motorhome you have the ease of setting up at a different lake every night, easily packing up and then moving on to your next destination. Easily driven and available in different sizes, and come with many of the comforts-of-home amenities you love. Class A: The biggest RV on the market this has all you can imagine ‘ and more. With a Class A, you may want to tow your car. Class C: A mini-motorhome, this comes with everything you could want and, like its larger counterparts, is available in a wide range of floor plans. If you’re new to the towable world, then opt for the ease of assemblage with the pop-up tent trailer. It’s well suited to large cars, minivans, and SUVs, they have full bathrooms and some even come equipped with outside kitchens. A veteran? Then ‘Fifth-Wheels’ is your best bet. Requiring a pick-up truck to haul, they offer an extraordinary amount of space while not skimping on comfort. These are ideal for those long-haul trips. If hitting the open road means activities, adventure and bringing all your toys along with you, then the Toy-Hauler may be the RV for you. Otherwise known as a sport-utility RV, this vehicle allows you to easily transport your favourite toys (like a motorcycle, Jet Ski, snowmobile, the list goes on’), easily driving them in and out with a ramp. You won’t lose a single amenity of an RV experience – the full kitchen, master bedroom, leather couch, & flat screen TV – and will still be able to go on adventures all year round. When you think of summer, what comes to mind first: the lake, the community, the family fun to be had? For you it’s time to enjoy a more relaxed way of living with the Park Model RV that gives you the freedom to find an amazing location, add a deck and enjoy the beauty of the outdoors. The best news’ All of this can be yours for a much smaller price tag than that property you were eyeing. Whatever you want to do and however you like to travel, there is surely an RV for you and your family to learn more, talk to your local dealer.